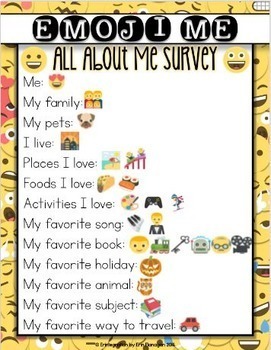 Easily integrate Google Classroom or Google Drive™ online storage service into your back to school plans by having students answer "all about me" items using ONLY Emojis! My detailed visual directions make it easy for all ages & teachers of all technology levels. If you have iPad® mobile digital device, get the iPad version here. 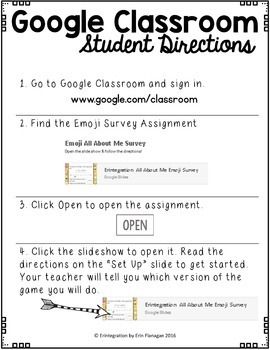 Packet & digital Google Slideshow includes everything you & your students need to use Google independently to fill out the survey template. 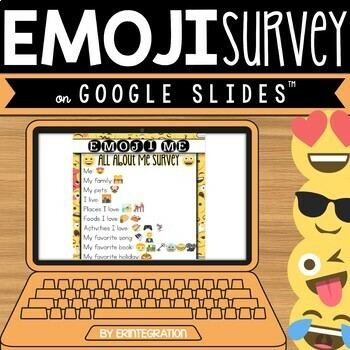 ★ Digital blank survey - 13 different items for students to respond to (available digitally with included link). Questions are in blackline too if you want to print! 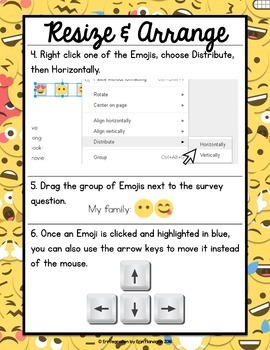 ★ Student directions to getting and arranging Emojis are available RIGHT in the slides for quick access. You and your students will need Google Drive accounts either individual or a shared account.